Many personal reports of paranormal encounters start off as relatively mild at first, gradually becoming more intense until reaching the point of actual danger. In other words, flickering lights, running faucets, and missing items were often precursors to hauntings that, in these cases, became far more sinister. 15. “The Night Stalker”: This woman claims that she would go to bed at night only to be woken up by strange noises and left with the unshakeable feeling that she was not alone. When she sets up a camera to record some evidence, she finds this bizarre footage the next day. Imagine watching yourself trying to sleep while this figure haunts your dreams. At one point the supposed phantom appears to be lunging at her. She says that she believe she was still awake during this point and remembers seeing nothing. Only when the contrast on the video was enhanced did anything become visible. 14. “The Ghost Pusher”: This footage comes from India, where a woman is seen cleaning up at a sink. Suddenly a dark figure appears behind her and gives her a hard shove from behind. She turns around only to find the room empty and hurries away. 13. “The Mirror”: A security camera records a woman as she sits in a dance studio with her back to the mirror. Suddenly her reflection turns around and stands at her menacingly. The woman continues on her daily routine and simply walks away, completely unaware of the danger behind her. If this video is real, then I can only imagine what would have happened if she had walked towards it instead. 12. “The Light Sensitive Ghost”: This video comes from another country, but you don’t have to know the language to understand what’s going on. A group of kids appear to have broken into some type of amusement park late at night and now they are now exploring the area. They are commenting on the various pieces of equipment when they come across a large replica of a woman that makes them fall silent. She is very pale with an expression of surprise and displeasure, almost as if she can see them and knows what they are up to. They move their flashlight over its eyes and the tall figure blinks once at them. The scared group goes off running and later submits their amateur footage to the local news. It’s then loaded onto YouTube soon after. 11. “Ghost Grabbed”: A man is walking down a hallway with both hands in his pockets when something suddenly materializes in front of him. The shadowy mass shoves him to the ground and drags him across the floor by his ankle with all of its strength. It suddenly disappears and he scrambles to his feet and runs away at full-speed. The YouTube community seems split as to whether or not the surveillance video left behind is fake or real. 10. “Barry Can’t Breathe”: According to a team of ghost hunters, this house in San Pedro, California has long been haunted by poltergeists who like open cupboards, throw plates, change television channels, and linger in certain rooms until a mother and her two children felt uncomfortable enough to leave. A lot of the events happened before the ghost hunters became involved, and therefore were never recorded, but it wasn’t uncommon for red liquid to drip from the walls of this haunted home for no explainable reason. Here is a quick clip of this happening in real time before the team’s very eyes. Eventually the ghosts drive the mother and her children out of the home, and the ghost hunters volunteer to stay there and investigate for several months. One day they hear three loud snapping noises coming from the attic and send a man named Barry to investigate. As he later recalls, something was up there waiting for them. Barry comes back down distraught and confused, now missing his glasses. Some kind of cord is wrapped around his neck, and he insists that something had tried to choke him upstairs in the attic. The investigation was called off not long after out of a concern for the team’s personal safety. 9. “The Dining Room”: A man claims that he keeps experiencing paranormal activity in his dining room and nowhere else He feels unsafe and decides to leave a camera running in the dining room to see what goes on when he’s not around. Nothing happens for a while, but then something comes along in the window that looks questionable. This is the zoomed in version. A tiny face appears to peek out at them from the glass panel on the bottom right before darting out of sight. You can’t really make out any of its features, but notice how some orbs float by shortly before this happens. It’s hard to tell if it’s a paranormal creature or just a small animal, but I wouldn’t want to be left alone in the house to find out. 8. “The Apartment Haunting”: A YouTuber named Joseph Chansuolme is absolutely positive that a ghost has been playing tricks on him, so he sets up a camera to record his apartment at night, since that’s when the majority of his otherworldly interactions have occurred. It’s past one in the morning when orbs begin to dash wildly overhead like fireflies. Then something turns on the bathroom lights and puts the faucet on full blast. Soon the door shuts by itself, and maybe it’s just me, but I think I hear a really weird noise after it closes, kind of like a sigh. Listen to this and let me know if you hear it, too. So anyway Joseph wakes up after a while and he hears the sink running. He immediately checks all around his bathroom only to find it’s completely empty. It’s important to note that I didn’t see any editing cuts between when the sink turned on and when he checked the room. If this is a fake, it’s very convincing. Here’s another video of the sink on a different night, this time taken in front of a mirror to show that no one was around. Joseph eventually moved away before the paranormal tampering could escalate into something more dangerous. 7. “Alcatraz”: A man is walking around the infamous Alcatraz when he picks up two possible paranormal encounters. I’ll start with the weirdest one first. He is inspecting a row of holding cells when a loud voice seems to call out to him with a single question. It sounds to me as if the deep voice is asking one simple word: “why”. The second possible encounter occurs as he is entering another part of the prison. Listen to this strange and haunting laugh. This one has a fairly reasonable explanation. Alcatraz is on an island, so maybe this was a bird call echoing off of the prison’s walls. I can’t tell for sure, so let me know what you think about these two events. 6. “The Sleep Watcher”: After multiple nights of getting no sleep and experiencing a deep sense of dread, this person sets up multiple cameras to record exactly what happens to them at night. When they check out the cameras the next day, they find this strange encounter. A faint shadow appears to linger above them for a moment before fading away. It has an unnatural shape and almost seems to reach out at them. 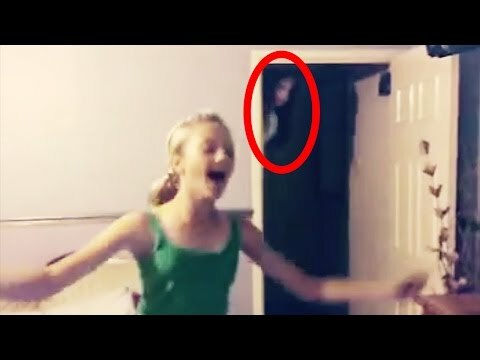 This video could be fake because this person was sleeping with their lights on, which is strange. But then again, maybe they were just trying to make sure there was plenty of light to catch the ghost on video. Some people have even suggested that this person was having an out of body experience during REM sleep. 5. “The Museum Curse”: Museum maintenance workers in Manchester , England were very suprised when this ancient Egyptian statue began moving by itself. It would always shift in its display case when they aren’t looking, and when they put it back in its spot, it would just move again on its own later. After determining that this was not some kind of prank, the museum workers became extremely curious and set up a camera. They were stunned to find the 4-thousand year old statue gradually moving in a perfect circle completely by itself on camera. Scientists studied this video extensively and eventually concluded that vibrations from foot traffic and nearby buses were causing the small figurine to shift in place. However, museum workers note that this figure has been a part of their collection for 80 years, and it has never moved before, so this reason is not exactly foolproof. Also, none of the other museum artifacts have ever displayed this kind of behavior, which has led many YouTubers to believe that this explanation is merely a coverup for the paranormal truth, and possibly a dangerous curse. 4. “Billy’s Dinner”: A child is left alone for just a moment, but still long enough for her to have a possible conversation with a ghost. Look across from her at the wrapped silverware in front of the glass and watch what it does as she speaks. The silverware moves all by itself shortly after she reminds an invisible person that it is not their dinner. She could be talking to an imaginary friend, but that doesn’t explain how the object moved without being touched. The ghost appears to leave her alone after this brief interaction and she happily resumes eating as if nothing happened. Exactly what it was planning to do to their food could be anyone’s guess. 3. “The Red Possession”: A woman appears to be obviously distressed and possibly possessed as she coughs up red liquid during a ritual exorcism. She coughs and gags until the front of her shirt is covered in a crimson liquid bubbling forth from her mouth. She spits out the red liquid out again and again. The man chants over her and jumps up and down with her until she stops speaking in tongues and appears to calm down. The audience claps and the video ends. 2. “The Stairway”: This CCTV footage shows a young woman hurrying down a flight of steps only to find something waiting for her at the bottom of the stairwell. The shadowy figure turns towards her and if you look closely, you can almost make out the circular white outline of a face. She bolts away and the apparition quickly pursues. If this video is real, then nobody knows what happened next or if she even survived. Before we get to number 1, if you’ve ever been curious as to what I look like in real life, then follow me on Instagram @dylan_is_chillin_yt, with underscores instead of spaces. I also have Twitter @YT_Chills where I post video updates. I’d really appreciate it if you followed me and feel free to send me a DM if you have a questions or suggestions. If you’d like to see more of these videos in the future, then hit that subscribe button because I upload a new video every Thursday. 1. “The Haunting of Paige”: This video was supposedly recorded by an unlucky couple who have been experiencing a rash of dangerous paranormal encounters. The paranormal specialist they were seeing suggested that they record every moment inside of the house for evidence. The couple is arguing about how inconvenient this is when suddenly something bad happens to Paige. The door slams shut, and when the boyfriend rips the door open, this is what he sees the poltergeist doing to her. The cameraman is slammed to the ground by an invisible force as Paige rides up a wall. She hangs suspended on the ceiling and then fall into the bathtub. She stares vacantly ahead with no emotion in her eyes as her boyfriend tries to comfort her. It is unclear if she ever recovered, or what her mental state is like now. Thanks for checking out this video. Be sure to subscribe because I upload a new video every Thursday. Or if you’re still not convinced, here are some of my other videos that I think you’d like. Enjoy! .